Dreams have been significant in many different cultures, carrying messages about this world and others, posing problems about knowledge, truth, and what it means to be human. This thought-provoking collection of essays explores dreams and visions in early modern Europe, canvassing the place of the dream and dream-theory in texts and in social movements. 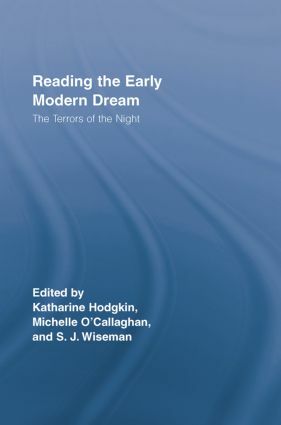 In topics ranging from the dreams of animals to the visions of Elizabeth I, and from prophetic dreams to ghosts in political writing, this book asks what meanings early modern people found in dreams. Katharine Hodgkin teaches in the School of Social Science, Media and Cultural Studies, University of East London. Michelle O'Callaghan teaches in the School of English and American Literature, University of Reading. S. J. Wiseman teaches in the School of English and Humanities, Birkbeck College, University of London. From Shakespeare to Jonson, Routledge Studies in Renaissance Literature and Culture looks at both the literature and culture of the early modern period. This series is our home for cutting-edge, upper-level scholarly studies and edited collections. Considering literature alongside theatre, popular culture, race, gender, ecology, space, and other subjects, titles are characterized by dynamic interventions into established subjects and innovative studies on emerging topics.